I don’t know about you, but I’m ready to say good-bye to 2017! In just three days we will close the door on 2017 and a new door—2018—will open. Although most of us tend to resist change, there are times when we welcome the end of a season, a job, a relationship, or situation. Change is inevitable, and change is good. How do you feel about the year to come? Does the prospect of a new year fill you with anticipation, hope, or excitement—or are you feeling fear and dread? Regardless of how you’re feeling about 2017, it’s worth taking some time to reflect on the past, and vision your future. In anticipation of the coming new year, I’d like to share with you some of my process, and invite you reflect, review, and do some goal-setting of your own. When I look back on 2017, what am I pleased about, or what went well? I recommend you review your calendar or journal for the past year before answering this question. The human brain is very good at remembering mistakes, or what didn’t work. But it’s not as good at remembering wins and successes. Sometimes this step alone is a significant mood lifter and encourager. What didn’t go as well I wanted, or didn’t work? While this question may sound like a downer, it’s helpful to think of this step not only as a way to acknowledge reality, but also to see where you may be able to course correct for a better outcome next time. For example, maybe you wanted to get in better physical condition in 2017 but you didn’t. When you look back on what didn’t work about getting in better physical condition, it could be that you needed to put your workouts on your calendar, or set out your workout clothes the night before. What life lessons did I learn in 2017? (Hint: these are often related to the events and situations that didn’t work well). As I reviewed my list of life lessons for 2017, every one of them was a roadmap for how I want to change the way I will approach situations (or people), and what I want to do more of in the future. And that leads to . . .
What can I do now—or in the future—that will either minimize or eliminate this problem in the future? Here, you simply write down what you learned or discovered as you reflect on what didn’t go well, and your life lessons from 2017. Ideally, goals should be specific, measurable, outside your comfort zone, and with a payoff that you know will enhance your life. As you review your list, be sure you know why these goals motivate you. If the goal is to please another person or is actually another person’s agenda for you, it’s their goal, not yours. Your goals should give you a feeling of pleasant anticipation, empowerment, or mastery. Easy and simple are best. For example, one of my goals for 2018 is to take an extended vacation with my husband. One of my first three action steps for that goal is to simply think about some options for where I’d like to go, and write them down. Making the first three steps simple and easy helps get you moving in the direction of making your goal a reality. Post your goals somewhere you will see them often, mark the due dates on your calendar, and set reminders to review them throughout the year, or until they’re accomplished. Gratitude is a guaranteed feel-good experience, and I’ve learned that no matter how bad things are in the moment, there is always something to be grateful for. List 10 things in your life that you are grateful for—nothing is too simple or mundane. My list includes having a supportive spouse, opportunities to learn and grow, and mentors who support and encourage me. I hope 2018 brings you even closer to realizing your hopes, dreams, and goals. Get Taming Triggers Solution Home Study Course free when you join the Partner’s Healing & Empowerment Online Community. Offer ends December 31 at 11:59 pm. For more information about the Community and to join online visit here. I loved the exercise it’s better than a goal list. Thank you for the share. Happy New Year. > I speak up, listen attentively, forgive myself, and look forward to tomorrow and the future. Glenda, I absolutely love your list, everything on it resonates with me! I hope that we all have a year in which our goals are reached and that we find happiness and success. VTP, thank you for your guidance, this blog has kept me sane and moving forward! This may sound syrupy or whatever, but for those who know me well, I am not at all one to put out flattery toward others. 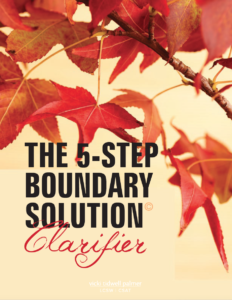 So, having said that, here goes: One of the things which I am so very grateful to God for during 2017 is for His having led me first to Vicki’s book on boundaries (which the principles she writes of apply to EVERY relationship in one’s life!) and after that to her online boundaries course, which have worked such goodness and empowerment within me and my life, along with all the great articles she writes online as well as her videos. And THEN, God gave me the amazing powerful healing opportunity in participating in one of Vicki’s Reclaiming Wholeness (childhood wounds healing) workshop! Not only did Vicki guide my individual ‘experientials’ to be so powerfully healing in and of themselves, but she taught us so much in applying healing principles to not only our childhood wounds, but also to our current life challenges. She also provided us with a huge workbook with tons of great info to take home with which we can continue learning and healing. I am sharing about and recommending this workshop to anyone God brings into my life who is yearning for childhood healing, which most definitely assists one in dealing with current life challenges too. One warning :) :) :) though: Vicki has thee most amazing, calming voice EVER!…and so if you attend the workshop, get plenty of sleep each night and bring your caffeine supply each day so you can stay awake as she guides others’ through their experietials:) :) :) Just listening to her voice in the online course was so calming too…during definitely non-calm days in my life:) God has blessed me with many blessings this past year, amidst greatly painful times – which He thankfully isn’t allowing those times to go wasted but using them to grow me stronger – and amongst the huge blessings is His having led me to discover Vicki Tidwell Palmer via online research. P.S. And no, Vicki did not at all whatsoever encourage me to write this posting…though I sure hope she will post this so that others will hear about what powerful help and healing is available through her book, online resources, and her workshop from one who experienced it all first-hand! :) Side note to you Vicki: if you post this, please just include written by “SRT”. Thanks! SRT, I am truly speechless. Thank you. It is one thing to receive helpful information and to be given opportunities to learn and grow, and quite another to use the information and opportunities to heal yourself. You have done just that and I honor you for it. I wish you a beautiful 2018!